Can you match up answers with the correct person? Similar to many other games where players attempt to write sily and funny answers to random questions, this game also has you match up answers with their owners. This game follows a chinese fortune based theme with great words of wisdom. Mr. Hu Said What is a fun party game that won't take all night to play. Check out the official game rules so you know how to play. You'll have a hilarious time playing and want to play again and again. Give Mr. Hu Said What a try today. Be the player to fill in the most fortune cookies on your answer sheet after three full rounds of play. You get 70 playing cards, 6 menus, menu wheel/spinner, answer/score pad, 6 pencils, 1 helpful hint card, Mr. Hu’s bio card and the official Mr. Hu Said What game rules and instructions. Please keep in mind that the official Mr. Hu Said What party rules and instructions could be different depending on the game version you have. The rules below are some of the exact directions on how to play Mr. Hu Said What. 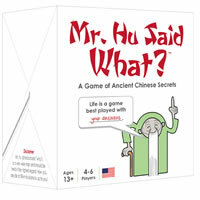 Share with us your comments, funny stories, tips, advice, strategies, creative ways to play, questions about how to play, problems with the rules or anything you want about Mr. Hu Said What. All submissions will be reviewed within 24 hours. Click here to add your Mr. Hu Said What comments.